The United States has dispelled the possibility that South Korea may lift sanctions on their mutual foe North Korea, arguing Seoul would not take action without first seeking approval from Washington. When asked by lawmakers whether her ministry was considering lifting economic restrictions on North Korea amid a historic warming of ties between the longtime rivals, South Korean Foreign Minister Kang Kyung-wha said Wednesday that "a review [of the issue] is underway," according to the official Yonhap News Agency. She then clarified that "there's a need to review it with resilience in the level of not damaging the framework of sanctions on North Korea on the basis that dialogue on denuclearization and an improvement in South-North relations is proceeding." Kang's remarks were met with criticism by some conservatives at home who demand Pyongyang acknowledge its role in a deadly 2010 naval incident, and in the White House, where Trump outright dismissed the possibility of South Korea acting unilaterally to improve relations with North Korea. "They won't do that without our approval," Trump said, according to the Associated Press. "They do nothing without our approval." In addition to international sanctions targeting North Korea over its development of nuclear weapons, former South Korean President Lee Myung-bak imposed additional measures after North Korea was blamed for the sinking of South Korea's Cheonan, killing dozens of sailors on board. The incident, for which North Korea denied responsibility, was one of many limited naval clashes to take place since the two former Cold War satellite states fought an all-out war in the 1950s. Unlike his conservative predecessors Lee and Park Geun-hye, both of whom have been sentenced to prison in separate corruption cases within the past year, current South Korean President Moon Jae-in has prioritized finding a diplomatic solution to the country's decades-spanning conflict with North Korea. Tensions flared between Pyongyang and Seoul's top ally, the U.S., last year, but North Korean supreme leader Kim Jong Un set out the potential for new peace talks during a New Year's address that has since served as a platform for an unprecedented detente. Moon has met with Kim three times with plans to meet again in December, while Trump became the first sitting U.S. president to meet a North Korea ruler in June and planned to see Kim again sometime after the midterm elections in November. North Korea has pledged to denuclearize in exchange for better relations with the U.S., but despite positive messages exchanged between Trump and Kim, Washington officials have displayed skepticism toward the young leader's motives. 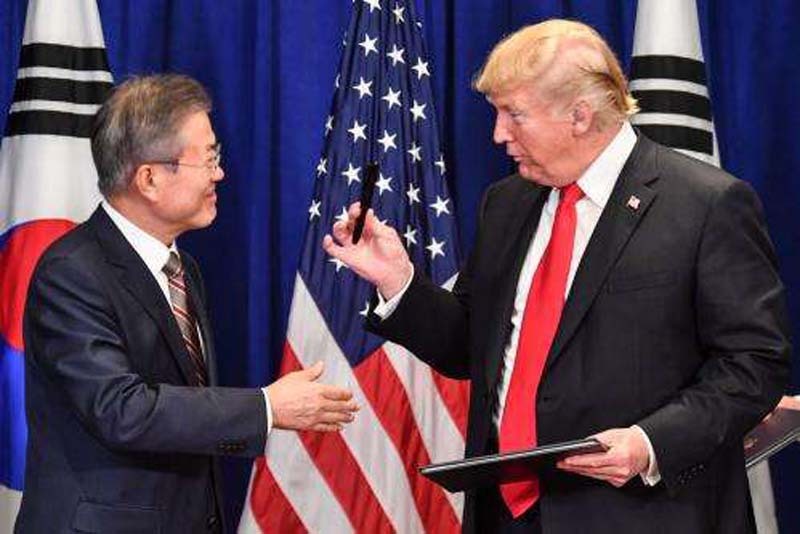 Seoul, on the other hand, has gone forward with a number of bilateral projects designed to thaw ties across the world's most heavily fortified border, some of which have reportedly been too ambitious for Washington's liking. Kang replied "Yes" when lawmakers asked her Wednesday if Secretary of State Mike Pompeo was displeased with South Korea's decision to enter into a military pact with North Korea in order to ease tensions on the boundary that separates the two. While Kim has praised the Trump administration for its willingness to engage on the issue, North Korea has also urged South Korea not to depend on its foreign ally. Since the first-ever inter-Korean summit in 2000, the two countries have officially maintained a policy of pursuing reunification "By Our Nation Itself," a phrase often used by North Korea's state-run media to downplay outside influence in a united Korea. The official Korean Central News Agency published an article Monday in commemoration of the "Era of Independent Reunification, Peace and Prosperity Ushered in by Great Love for Nation." The piece praised Kim's efforts in working with South Korea to find peace, without mention of any U.S. role.